If ever there were an appropriate title for a record by an artist like Clifford Blivens it has to be this one. 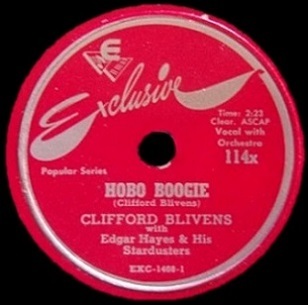 A vagabond figure in the orbit of stars who was destined to remain grounded himself… a relatively short-lived career albeit with a fair amount of opportunity that amounted to nothing in the final tally… yet someone who nevertheless rolled on with an admirable degree of optimism and enthusiasm, Clifford Blivens was the living breathing definition of a journeyman performer in rock. 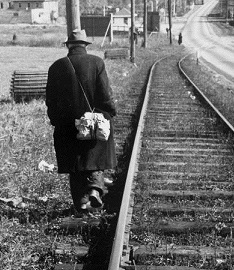 In short he was a musical hobo who may never have had a firm destination in mind but was never averse to getting out on the stage to boogie. Though not everyone who goes on to be wildly successful in music comes out of the gate looking and sounding like stars, usually there are enough signs evident along the way so that when somebody emerges as a top notch talent you can look back and reasonably say you saw the potential there from the beginning. The majority of artists though have far more limited skills and so their ability to sustain a longer career, and even get a few small hits, comes down to peripheral factors – a particularly stellar song that can’t help but be successful, a first rate band to cover your weaknesses, a solid record label to promote your releases and an ample supply of good timing to capitalize on whatever trend is about to hit. The fewer of those boxes you check off the weaker your chances are to get noticed and stick around for any amount of time. After all there’s always newer, younger acts coming along whose commercial appeal is untested and they make for better options for record companies to take a shot with than someone who’s only shown failure. Thus for all the hopefuls and wanna-be’s in rock ‘n’ roll who were dreaming of being something more than an easily replaced opening act at small town clubs, it’s imperative that each and every time you get an opportunity to release a record you have something well-crafted and worked out to the smallest detail of the arrangement to give you the best chance at breaking through. Clifford Blivens had done so his last time out more or less with Achin’ Heart Boogie. On paper it shaped up to be little more than a halfway decent song using a strictly by-the-numbers lyrical approach, but the record was bolstered by two factors, his own full-throated enthusiasm in delivering the lines and the first-rate backing by Edgar Hayes & His Stardusters, particularly guitarist Teddy Bunn whose imaginative playing made it stand out in any company. The fact that he’s paired up with them again on Hobo Boogie should keep him in good stead, but whether the well of inspiration ran dry or if they’d merely thrown all of their effort into that first record and were merely padding out the session with generic material thereafter, the hope you have that Blivens might surprise us once again doesn’t last very long. What’s worse is the high regard we’ve come to hold Hayes, Bunn and company in by virtue of their own string of consistently strong releases is also in danger of being called into question here as they fall prey to the same dwindling standards that afflict Blivens, pulling them all down together. merely made due by finding something basic and working within that framework, hoping for the best maybe but never realistically expecting it. That’s clearly the case with Hobo Boogie, another generic composition that has some of the requisite components to at least meet the basic standards of the day but a record that’s done in by the fact they didn’t put enough thought and planning into bringing out its best attributes while shoring up its weaknesses. Problem number one is that it can’t fully decide what type of record it wants to be. There’s a very strong blues element to this which takes it a little too far astride of his earlier releases, not just the aforementioned rocking Achin’ Heart Boogie, but also his less aesthetically successful vocal performance on Big Jay McNeely’s Midnight Dreams, something of a classier uptown lament affixed with Blivens crude lead. Now you can say that heading in a bluesier down home direction showcases Blivens versatility. Except that Blivens’ approach on all of these records is the same. He’s just not a skilled enough singer to vary his delivery for different type material, only the arrangements they’re housed in change and so if he’s going to let Hayes and The Stardusters take this in a more rural direction as they seem to want to do, then it would work better if he himself followed their lead so at least they were all on the same page. But that brings us to problem number two, which is the inadvisable decision on the part of Hayes and Bunn to venture into the bluesier part of town in the first place when the artist himself is ill-suited for that kind of performance, something compounded by the fact that whatever small modicum of recognition Blivens might already have earned from his work on the bandstand with McNeely was in the rock vein. Changing horses in mid-stream isn’t likely to get you hits, it’s only going to get you wet. But damp pants wouldn’t be the worst thing if the arrangement they came up with was more well conceived and so while Blivens’s role in the song, which he wrote, is not anything special, it’s ultimately the responsibility of the band to give him the best platform to make all he can out of what he has to work with and that’s ultimately where Hobo Boogie fails. The rolling piano boogie of Hayes in the intro is a welcome sight, giving this the impression that it’ll be something you can move and groove to at the very least, but as soon as he gives way to Blivens and the rest of the band things take a turn for the worst. Blivens has come up with a pretty simple story that offers no surprises as he details his litany of bad luck and misery but it doesn’t have to be too intricate to be reasonably effective. If the concept itself is unimaginative the lines he uses to tell this tale of woe are decent enough to carry this along without insulting your intelligence. Of course Blivens is too ramped up for the content, something that never changed with him as he always sounded as if he were singing without being fully confident that the microphone was plugged in and so he’d always sing louder just to make sure he was heard. That does little for the mood of the song which should have him downhearted as he ruminates about his lot in life but instead finds him full of vigor when letting you in on his predicament. Inappropriate as it may be considering the content his singing itself is okay, particularly the stop-time bridge and his usual strong emphasis on the cadences of each line. He was never someone who was going to transcend the material with his vocal talents but was also wasn’t going to kick away an otherwise solid song because of his shortcomings. Blivens worked well within his limitations for the most part and there are worst things to be than narrowly predictable, provided there’s some appealing aspects found within that approach. But while Clifford Blivens had a relatively low ceiling in terms of ability the same can’t be said for the skill set of Teddy Bunn, one of the pioneers on electric guitar in any style who’d recently given plenty of notice as to how the instrument might be best utilized within the rock format. 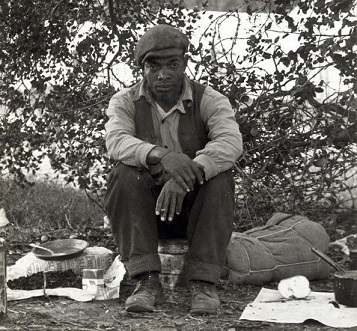 Tremendously versatile with his playing, wildly creative with his lines and perfectly willing to settle into a supporting role for the good of a song Bunn nevertheless comes up well short in all of those areas on Hobo Boogie even if what he’s playing when viewed out of the context of the song is pretty decent. Unfortunately you can’t take the primary accompaniment away from the rest of the record and judge it on its own merits, it needs to be evaluated first and foremost by how it contributes to the song and the vocal performance and this just clashes with both. The accelerated pace of the tune has already been delved into when it comes to Blivens choosing wrong for the subject matter, but that’s exacerbated by Bunn who seems to be egging him on with fleet-fingered playing. That of course brings us back to the nature of these recording sessions where little time was given over to working out an arrangement in advance, then wood-shedding to tighten it up and if necessary overhaul it completely until you find the right formula for the material. 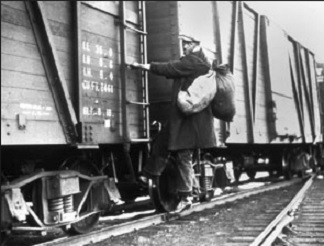 Hobo Boogie however sounds like a rush job, something conceived to match Blivens usual high revving delivery rather than keeping the brakes applied each time he wants to step on the gas. Furthermore the tone of Bunn’s guitar is decidedly out of step with current rock sensibilities, hence the blues-references get spotlighted rather than hidden with a more up-to-date arrangement. Though it can be said that Bunn’s technical proficiency in what he plays here is fine, there’s no cohesion with anything else to be found here. If everybody from Blivens on down was simply going to ignore the details of this lament and tear into this song as if it were a celebratory rave-up then Bunn needed to dial his playing up to eleven and make you forget the topic altogether. Instead he compromises and plays too exuberant to comply with the lyrics, but doesn’t thrash about enough to override its meaning. The others are mostly incidental here, as even the extended sax solo which closes this out is underwhelming in both power and creativity. Hayes himself never returns to the spotlight after that brief lead-in to the record and Blivens meanwhile doesn’t get a chance to wrap the story up in a suitable way, giving the last minute of a song that only clocks in at 2:18 over to the band. Mismatched musical goals combined with a perfunctory vocal appearance by someone not really following the material in how he presents it make this substandard in every way. It’s essentially an instrumental with a guest appearance by a singer, yet the instrumental parts are the weakest aspect of the record. Hobo Boogie is a throwaway performance at best, end of the session filler material that found itself thrust into carrying a record that should’ve built upon the gains Blivens made last time out but instead sent him to the back of the line once more, well-intentioned as always but irrelevant all the same. That’s the life story of so many of rock’s also-rans who may have theoretically had it in them to overcome their modest talents if only they’d put as much effort into the planning stages of their records as they did the enthusiastic singing they hoped would make up for it, but as we know all too well, it never does. Leave a reply on "Clifford Blivens: “Hobo Boogie”"